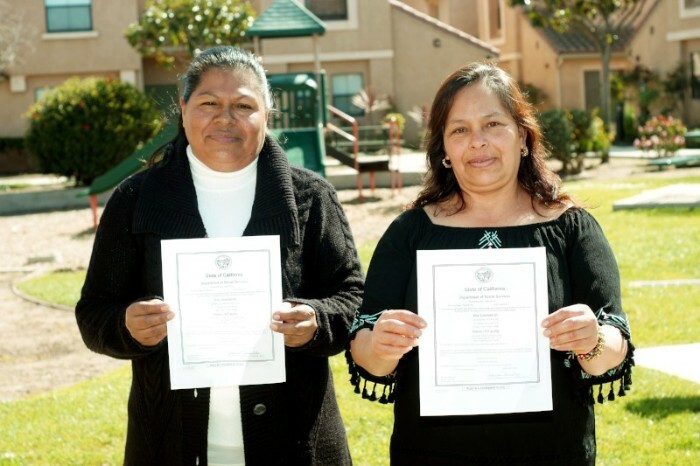 Business Owners – Guadalupe Mendoza and Elvia Salazar, residents of Peoples’ Self-Help Housing’s (PSHH) affordable housing developments in Santa Maria, are now officially licensed childcare providers thanks to the Neighborhood Child Care Licensing Project. Two Santa Maria women can now call themselves “business owners” after being among the first to successfully complete the Peoples’ Self-Help Housing’s (PSHH) Neighborhood Child Care Licensing Project. The opportunity was made available to five residents living at PSHH’s affordable housing properties who were already providing in-home childcare and wanted to turn their passion into a licensed business. Santa Maria resident Guadalupe Mendoza was another PSHH resident who successfully earned her license. The project, which was generously funded by the Edwin and Jeanne Woods Family Foundation and Santa Ynez Band of Chumash Indians Foundation through a NeighborWorks America collaborative grant, was created through the Working Neighborhoods and Workforce Literacy Initiative, a collaboration between PSHH and The United Way of Northern Santa Barbara County. Supported by the Children’s Resource and Referral of Santa Barbara County, Central Coast Literacy Council and EconAlliance, PSHH provided additional support through the provision of classroom space and project coordination. The success of the program has attracted the attention of the Community Foundation of San Luis Obispo County, who has supplied generous funding to replicate the project. Training will be offered to 10 PSHH residents and, in partnership with the CAPSLO Child Care Resource Center and Literacy for Life, will seek to address the similar shortage of trained childcare providers in San Luis Obispo County. The Childcare Program license, which is issued by the State of California, requires the provider be at least 18 years old and complete approximately 25 hours of training. The training includes pediatric health and safety, CPR and First Aid certification, tuberculosis testing and immunizations, criminal record clearance, State home inspection and fingerprinting. Completion of the licensing process is at the provider’s own pace and is estimated to lead to an increase in income for the provider from $10 per child per day to $35. The benefits in using a licensed provider are not limited to knowing that care is being provided by a professional but also allow for the cost of the care to be eligible for subsidies and tax benefits.